The Special Service Package (SSP) was a factory optioned Police Car. Ford offered this package on the Mustang from 1982 through 1993. It was built upon a LX 5.0L Notchback with either the 5-speed manual or 4-speed automatic transmission. The package added; certified calibrated 0 to 160 mph speedometer, front lower radiator air deflector, engine oil cooler, reinforced front floor pans, aircraft-type radiator and heater hose clamps, automatic transmission oil cooler, heater hose inlet restrictor, full-size spare tire, P216/65R15 all season Goodyear Eagle GT tires, 15x7" 10-hole cast aluminum wheels, and single key locking system. Silver 1993 Mustang LX coupe with the Special Service Package (SSP). Why? Because it was a unmarked Police car! 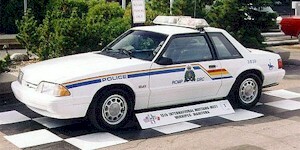 The Special Service Package was available on the 1982 through 1993 Mustangs. It included: 5.0L HO V8 engine (sequential multi-port injection, forged pistons, roller cam, Hypereutectic pistons, engine oil cooler, aircraft-type silicone radiator hoses and clamps), 5-speed manual or 4-speed Automatic OverDrive (AOD) transmission, auto transmission fluid cooler, power disc front / drum rear brakes with rotor shields, stainless steel factory headers, dual exhaust system with stainless tips, 15.4 gallon fuel tank, heavy duty stabilizer bars, full instrumentation with in-dash tachometer, 130 and 135 amp heavy duty alternators, two-piece VASCAR speedometer cable, certified calibrated speedometer 0-140 and 0-160 mph, non-operational courtesy lights for safety, relocated rear deck release, single key locking doors and trunk, reinforced floor pans, full-size spare tire, and 15" X 7" cast aluminum wheels.